Access to affordable healthcare is not the most glamorous subject. Unsurprisingly, it has also not proven to be the most fertile ground for artists. With the insurance mandate coming upon us soon, it seems that, regardless of where we stand on the new law, insurance will continue to dictate what we choose to do with our lives. For me, the topic scarcely leaves my mind. I am on the precipice of turning 26, a graduate student, an intern, and sometimes food service employee. I am both the reason the mandate exists — to get healthy young people to buy insurance — and on somewhat unsure footing financially. In spite of the interminable discussions of the new healthcare law, there seems to have been a failure, among many, to unite around the simple truth that at some point we all get sick. The healthcare mandate pushes this inevitability to the forefront in a way that seems new and provocative. The art world may appear aloof to these everyday struggles with common bureaucracy, monthly budgeting, and automated voice-messaging systems, however, I believe that certain works from the late 1980s and early 90s made in response to the AIDS crisis can serve as a model for how artists and the art world can tackle these very personal, but not very glamorous, issues. Perhaps the result of reflecting on these works done at a time when health was also a passionate political issue — in admittedly a very different way — could be projects that have the potential to speak to a broader audience united around something as simple as the common cold. To me, this tension between the glamor of art and the common experience of illness seems to manifest through the later projects by the Canadian art collective General Idea. Formed in 1969 in Toronto, General Idea was a collective of three artists, under the pseudonyms AA Bronson, Jorge Zontal, and Felix Partz. Their first 15 years revolved around “Miss General Idea,” a concocted fantasy, both woman and muse. They staged beauty pageants, set up boutiques, and created cocktail lounges, languishing in artifice and deifying glamor. From 1972 to 1984 they theoretically constructed the labyrinthine Miss General Idea 1984 Pavilion, which was then destroyed and carefully excavated and presented through relics and remnants of a mythical disaster. Much of their work was created in editions or multiples to be sold in the various boutiques and lounges accompanying their gallery installations. Within the Walker’s collection, both the Nazi Milk Glass (1980) and The Getting into the Spirits Cocktail Book (1980) are representative of this period. For years they created and constructed, piling layer upon layer cultivating their image, until, as has been noted by others, Miss General Idea and glamor, her faithful companion, were practically members of the group. In the 1980’s two of the group’s members, Jorge Zontal and Felix Partz, contracted HIV. Their work took a definite turn and became more overtly political, particularly with the inauguration of the AIDS Project. 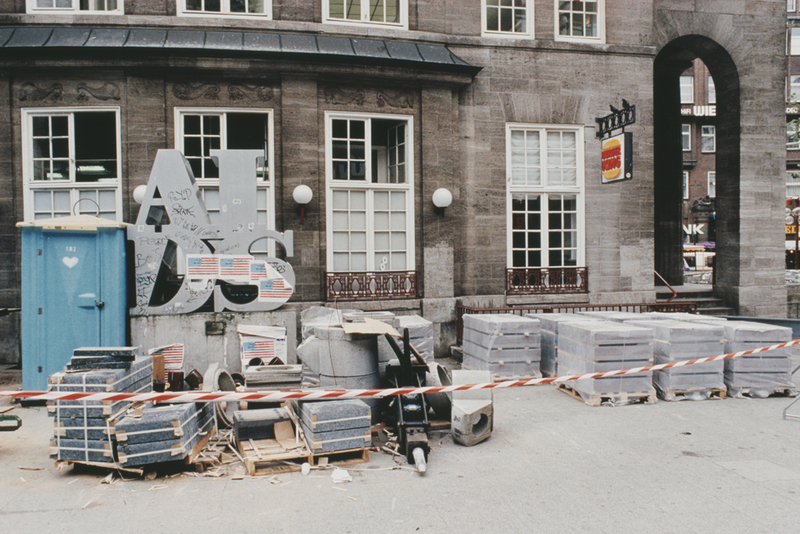 Through various public commissions, this project, also known as Imagevirus, involved plastering billboards, buses, and subways with a distortion of Robert Indiana’s LOVE design manipulated to read AIDS. Later, in the early 1990s, General Idea began integrating pharmaceutical imagery, in the form of large multi-colored pills in a series of exhibitions titled PLA©EBO and Pharma©opia. In the installation Magi© Bullet (1994) the ceiling in a sparse white gallery was filled with silver Mylar balloons resembling both some sort of sterile fungal infestation and a thick cloud of pills. Although these installations seem to take an unsentimental view at the medical industry and illness itself, they mark an attempt to work through overwhelming personal trauma while maintaining their illusive image. 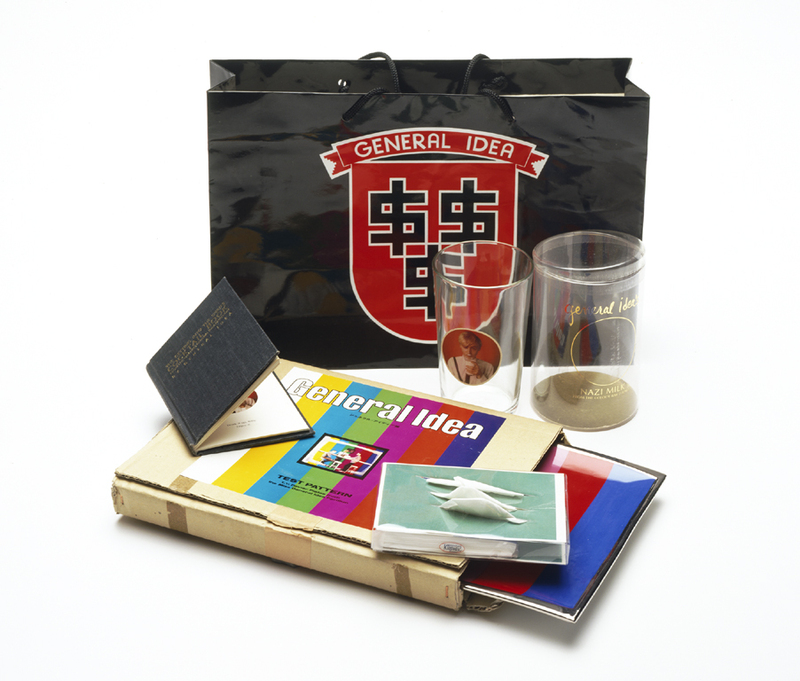 While General Idea raised awareness of the proliferation of AIDS, they also, I think, forced an objective confrontation with the inevitable fact that we all get sick. During this later period General Idea continued to create the editions that were sold alongside the installations. They made AIDS Stamps (1988) and AIDS Wallpaper (1989), recently on view at the Walker during This Will Have Been: Art Love and Politics in the 1980s, and small PLA©EBO pins. They also stayed true to their “image”-centered practice; they referenced heroes of the European avant-garde, purportedly in an attempt to gain recognition for European artists in North America, which they saw as lacking. These playful nods can be seen in the edition Infe©ted Rietveld (1994), a reproduction of Gerrit Rietveld’s quintessentially Modern Red/Blue Chair (1918), painted in the colors of the AIDS logo, thus “infected” with the disease. In the Walker’s collection of General Idea’s editions, I was drawn to what appeared to be a simple object with an apparently heady title, Gesundheit: Why not sneeze Lucio Fontana? (1991), partly because it seems a perfect combination of these two impulses I just described, the ethereal presence of the avant-garde and the earthly reality of illness, and also because “Gesundheit” is just an excellent word. The edition is itself a familiar object to anyone who has spent time in a wintry classroom — a distant memory which gets closer by the day — the constant sound of sniffles, sneezing, and maybe a quiet uncontrollable cough, and the constant movement towards the necessary box of tissues in the back of the class. It is a small box, usefully clear, so you can see the short stack of tissues conveniently pulled through the top, ready to grab at a moment’s notice. This box of tissues, however, is rather different than those to which we have become accustom. Although stamped with corporate label of our regular brand, Kleenex, this box has three slits cut into the top with three tissues tufting through them. These two extra slits reference what are now iconic triumphs of the avant-garde, informally known as Lucio Fontana’s cut pieces. Atop and below the small stack of tissues are two postcards picturing two of Fontana’s green pieces with three gashes from the collection at the Ludwig Museum in Cologne. 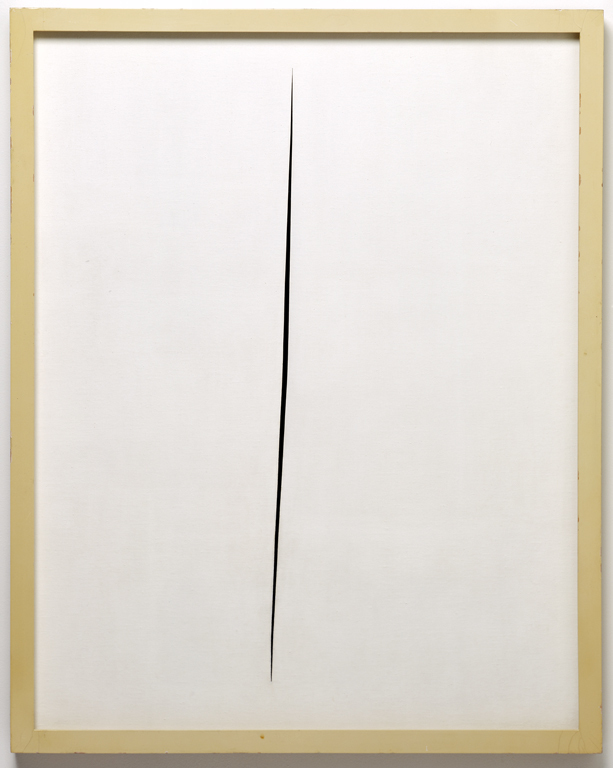 Fontana’s cut pieces are monochromatic paintings with thin gashes cutting through the surface exposing the supporting wall, many such works were exhibited at the Walker’s landmark exhibition in 1966, Fontana’s first solo show in the United States. Dated to 1964-65, the piece Concetta-Spaziale: Attessa or Spatial-Concept: Expectation in the Walker’s collection is a great example. Painted in white, the canvas has just one long cut right down the middle. This piece in particular, with its white surface mimicking the “pure” white standard of the gallery wall, plays with the painting’s relationship to its environmental space. The cut, a seemingly violent act, serves to both distinguish the canvas from the blank white walls while purporting to offer a small view into the institutional supports. 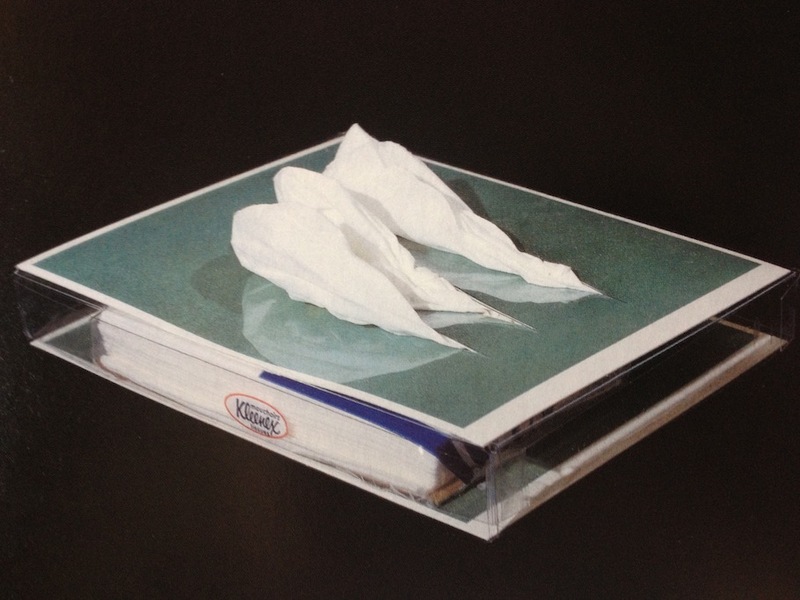 General Idea’s Kleenex box manipulates the voids created by Fontana’s cuts by filling them with soft white tufts of tissues, certainly more comforting and banal than the dramatic gesture from which they originated. The reproduction of Fontana’s work in the edition is both an homage to his almost industrial creation of the cut pieces and a mocking jab at the high-minded principles with which they are associated. The title seems to ask Fontana to perhaps take a break, perhaps falter, at least stop to sneeze for heaven’s sake. Although the relation to health and illness is subtler than if the box had been covered with word AIDS or red, blue, and green pills, the simplicity of the Kleenex box is possibly the best reminder of the inevitability of illness. We carry them with us even when we don’t need them, and there is nothing worse than being caught without them in a time of nasal need. So, in these discussions of who’s to pay for whose medicine, who should take care of whom, it is important to be open and honest with yourself: someday at some point, you will be sick, it’s why there should always be a box of Kleenexes at the back of the class.